• Locate large trees away from property lines, phone lines, foundations. • Place some deciduous trees and shrubs on the south of your house to provide shade in summer. • Evergreen trees are useful on the north and west to serve as windbreaks in winter. • Create several areas of transition — edges — as this is the most active area for wildlife. • Buy trees as large as you can afford and plant them sooner rather than later, as they take much longer to reach maturity. • Leave dead trees (called snags), both standing or fallen, where they are. Hundreds of species use snags for nesting, resting and food. • Plant vines and shrubs around snags to hide them. • Plant a variety of species, but plant the same species and colors in groups. • Plant in groups of odd numbers — 3, 5, 7, etc. 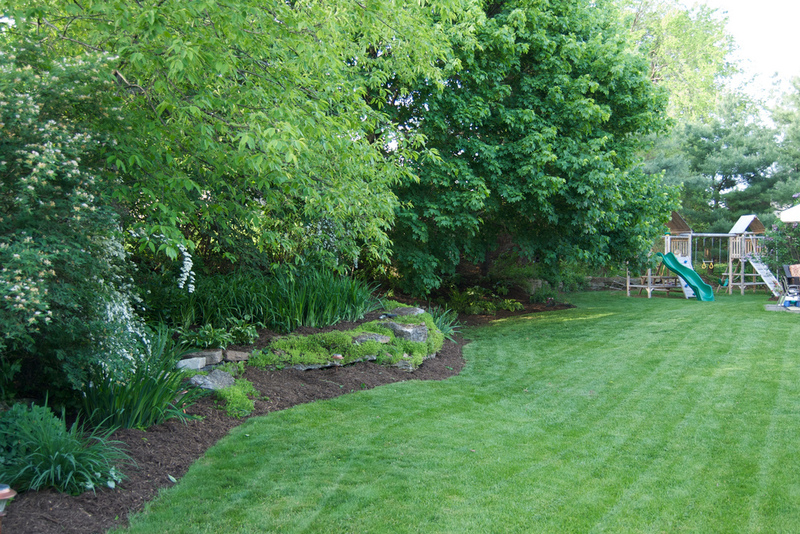 • Create a curving pathway through the yard and planted beds. Curvy paths add style. • Pathways also are convenient for maintenance of your gardens. Are you planning to use weed barriers? Landscapers, in particular, make wide use of weed barriers, which seem like the perfect solution against weeds. Unfortunately, it isn’t that simple. Plastic barriers aren’t organic and will alter the composition of the soil underneath by killing everything that was living in it. There are fabric barrier alternatives to this, that allow the soil to breathe. But both types must be mulched to look presentable and once the mulch decomposes into a layer of “compost,” the weeds will be back. This inescapably leads to the headache of trying to de-weed the area without disturbing the costly underlying barrier. So, why not just save the cost of a weed barrier and cover the soil with a 3-inch layer of wood mulch. You can hand-weed or use a hoe, as necessary, then cover with a new layer of mulch. If you want an extra weed barrier, place newspaper (7-9 layers thick) or paper bags under the mulch. If you’ll be using an attractive covering of rocks in a planting bed, it makes sense to hold down the weeds as long as possible by using an underlying weed barrier. Alas, as windblown organic debris decomposes among the rocks, weeds will eventually manage to find a footing. Mulch your planting beds. It dresses up the bare ground, but more importantly, mulch reduces weeds, cuts down on watering, improves soil quality, prevents erosion and provides cover for insects. Mulch needn’t be expensive. Mulched leaves and mowed grass also can be used as mulch. Even weeds themselves can be mulch — just leave them laying on the soil where you pulled them. Don’t cover them with other mulch for several days to ensure they’re completely dead. Also, don’t use weeds with seed heads on them. Read about types of mulches here. There’s been much opposition from environmentalists to chemical weed control. Circumstances, however, may sometimes make this the best solution — so long as you use an agent that quickly degrades, such as Round-Up®. This product will kill any foliage it touches and it works systemically, only killing the plant it’s sprayed on. There’s no need to spray the soil, either, as it only works on plants. About 72 hours after use the plant is dead and the soil can be safely used for digging and planting. Read the label carefully, spray only on a day that isn’t windy, and adjust the nozzle so it isn’t emitting a fine mist. Drifting chemical will kill whatever it touches. Don’t get any on yourself — recent reports suggest that Round-Up may cause cancer.